The Hoodie has had something of a chequered history, but the hooded sweatshirt that was once banned in some shopping centres in England and which has even been discussed in the British parliament has risen from its somewhat shady street past to become a sought after item of designer clothing. Today, thanks to designer versions of the garment, such as the Off White Hoodie and the Stone Island Hoodie, the reputation of the humble hoodie has been transformed to such an extent that hoodies are now even a part of Zara Phillips’ equestrian clothing range. Hoodies are nothing new. In fact, they date all the way the back to the 12th century. The word hood is derived from the Anglo-Saxon word hōd, which means hat. The hoodie style of garment has its origins in the hooded cowl that medieval monks used to wear. The first hooded sweatshirt of the type that we know today was produced in the United States and it was marketed mainly to construction workers who were working in outdoors in the cold winter weather of New York. The hoodie first became fashionable in the 1970s, when it became associated with the hip hop culture. Its popularity received a further boost when it made an appearance in the Rocky movie. Top designers such as Norma Kamali then took the hip hop fashion item and turned into a high fashion, designer clothing item. By the 1990s, designers such as Ralph Lauren, Tommy Hilfiger and Giorgio Armani had caught onto the designer hoodie trend and the garment was heavily featured in their collections of that decade. The hoodie gained a bit of a bad reputation in the UK in the 1990s, because it was often used by shoplifters to hide their faces from store security cameras. The garment was banned in some shopping centres and the controversy eventually led to the famous “Hug a Hoodie” speech by David Cameron, in which the then leader of the Conservative Party suggested that some people wore hoodies as a defence rather than to hide their faces while they committed crime. Roll forward to the 21st century and, like so many fashions that have their origin in streetwear, the hoodie is now a sought after piece of designer clothing that has joined the mainstream. Two examples of modern designer hoodies are those produced by the brands Off White and Stone Island. The Off White designer clothing range, which includes T-shirts, footwear, accessories and the Off White Hoodie. The brand’s clothing range is said to have been inspired by old-style mountaineering clothes. Off White is headed up by the designer and DJ Virgil Abloh, who is well known for the work he has done with Kanye West. 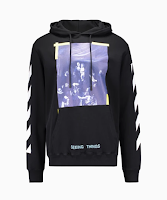 Off White clothing is a brand of modern designer streetwear influenced clothing that has really caught on with celebrities. Artists who have been seen wearing Of White clothing have included Rihanna, Jay Z, Swaggy P, and 2 Chainz. Founded by the Art Director Massimo Osti in 1982, Stone Island’s unique use of colours and fabrics has made it one of the most popular modern designer labels around. As well as the Stone Island Hoodie, the range also includes joggers, coats, jackets, T-shirts and polo shirts. The Stone Island brand is another clothing brand that has attracted a celebrity customer base. Tinie Tempah, Jason Statham, Drake, and Skepta have all been seen sporting the famous Stone Island Compass logo on their clothes. 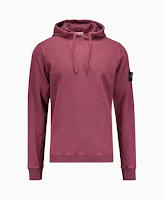 So, from medieval monks, through shoplifters, to “A List” celebs; the hoodie has certainly been around, and with Stone Island, Off White, and other big designer brands continuing to feature high quality hooded tops in their collections, the designer hoodie looks all set to remain a major part of designer fashion for many years to come.